Yangtze travel guide,Yangtze cruise,Yangtze photos. The Yangtze River, the biggest river in China, the third longest in the World, starts with the Tuotuo River at the Roof of the World -Qinghai-Tibet Plateau, takes in countless rivers, and flows eastward across the interior of China. With an overall length of more than 6,300 kilometers, it marches permanently toward the East China Sea, singing the songs of the four seasons with its waves. The Yangtze River, next only to the Amazon and the Nile, is the third biggest river in the world and is a cradle that breeds the ancient civilization of the Chinese nation. It cleaved a path and made its way through the mountains to have formed these uniquely beautiful, magnificent, and wonderful gorges-the Three Gorges: Qutang Gorge, Wu Gorge, and Xiling Gorge. 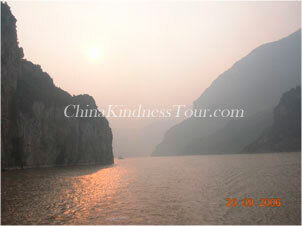 The Three Gorges have showed the magic workings of nature with their marvelous and beautiful mountains and waters. The grotesque peaks and rocks on the two sides of the Three Gorges are accounting the great changes taking place in the region in the past billion years, and the variegated wracks of lives sleeping deep between the rock layers are narrating the history of the evolvement of lives during the past hundreds of millions of years. How many visitors have been attracted here by the charming thousand-year-long history of the region, the great ancient relics of human civilization, and the mysterious folk tales! Sandwiched between the mountains on the mid part of the Yangtze River, the Three Gorges runs across Fengjie and Wushan Mountain in Sichuan Province and Badong, Zigui, and Yichang in Hubei Province, extending 193 kilometers long to include Qutang Gorge, Wu Gorge, and Xiling Gorge. City of White Emperor in Fengjie is the vital passage of the west part of the Three Gorges. Nanjinguan in Yichang is the important gateway of the east part. Along the banks of the Yangtze River, the high peaks rise in emerald verdure, overhanging rocks tower into the clouds, dangerous cliffs seem to reach the sky, rocks are jagged and grotesque, waterfalls are spraying and sparkling, clouds and mists are curling, rapids and torrents are seething, and fierce waves are Gorge, deep, serene and exquisite; while Xiling Gorge perilous for its shoals and rapid currents.